Australia - A Sustainable House in the City - A small urban family remodels its 100-year-old house to achieve water and energy self-sufficiency. Fiji & Cook Islands - Coastal Fishery Restoration - Traditional no-take reserves and seasonal taboos restore troubled coastal fisheries. Guam - The Humåtak Project - A community-based project works to restore Guam's watersheds, coral reefs, and fisheries. Vanuatu - Coconut Oil as an Alternative Fuel - In a time of decreasing copra prices and increasing petroleum prices, coconut oil holds promise as a "biodiesel” fuel. In the 1970s, Fouha (aka Fu’a) Bay on the southwest shore of Guam was home to a healthy coral reef ecosystem teeming with marine life, according to data from the University of Guam. But in 1988-1992 the Agat-Umatac Road was constructed without environmental mitigation measures, and hundreds of tons of sediment washed into the bay. The nearshore corals were smothered and killed, and the reef became dominated by algae instead of coral. Besides this catastrophic event, ongoing soil erosion and sedimentation are caused by ungulates (deer and pigs) and human activities in the watershed—especially the deer hunters’ practice of burning whole hillsides of forest so the tender new sprouts will attract easy-to-see deers. Some hilltops have become “hardpan,” i.e., all the soil has washed off and no plants can grow. By 2002, fishing had gotten so bad in Fouha Bay that fishermen in the village of Humåtak (aka Umatac) took their concerns to Mayor Tony Quinata. They believed sedimentation was at the root of the problem. The mayor contacted Robert Richmond, then director of the University of Guam’s Marine Laboratory, for assistance. Dr. Richmond confirmed that sediment is the reef’s primary stressor, and any improvement would require better land management in the bay’s 5-km2 watershed. He assembled a team of researchers from the University of Guam Marine Laboratory, the University of Hawai‘i Social Science Research Institute, and the Australian Institute of Marine Science and obtained funding from the U.S. National Oceanic and Atmospheric Administration (NOAA). In cooperation with the mayor’s planning office, the researchers implemented a collaborative watershed planning project to help the people of Humåtak identify problems and solutions. This was the beginning of the Humåtak Project. As a partnership formed between community members, scientists, and resource agencies, the Humåtak Project became a community-led initiative with numerous partner organizations in the government, the university and high schools, and non-governmental organizations. “What we have is a community that is fully engaged in caring for their ecosystem,” says project coordinator Austin Shelton. Shelton is a marine biology Ph.D. student and a research assistant to Dr. Richmond at the University of Hawaii Marine Laboratory. They continue to provide scientific guidance and coordination for the Humåtak Project community restoration effort under a NOAA grant titled “Science to Conservation: Linking coral reefs, coastal watersheds and their human communities in the Pacific Islands." restore the health of the once-vibrant coral reefs and the abundant nearshore fisheries. The three main components of the project are: educational outreach, watershed management, and scientific research. The ‘Humåtak Project Educational Outreach Team’ delivers environmental education presentations to classrooms, summer camps, and community groups. Presentations focus on the problem of erosion, which leads to the destruction of native forests, loss of fertile land, contamination of drinking water supplies, sedimentation on coral reefs, and loss of the essential fish habitat. The Humåtak Project also hosts “Watershed Adventure” field trips, taking participants through the watershed and explaining ecosystem connections. The first of these was in November 2012, when 160 participants—mostly high school marine biology students—hiked from the top of the watershed down to the bay and learned about the ecosystem. Half a dozen more Watershed Adventures have been conducted since then. “The reefs further from shore are still OK,” says Shelton, but “the land is moving into the sea. We want to help the coral move back toward the land.” According to Shelton, once the stressor of sediment is removed, the reef can heal itself through natural processes. Sediment is gradually flushed out of the bay and fish will eat the excessive algae. Beginning in 9011, the Humåtak Project’s erosion control projects include an innovative combination of reforestation and soil stabilization. In addition to planting tree seedlings, sediment filter socks are installed on the slopes of the watershed. The trees are donated by the Guam Department of Agriculture Forestry Division. The filter socks are created by the Humåtak Project itself, by stuffing mesh stockings with mulch and shredded telephone books. The socks are placed across the flow of water. They reduce erosion in three ways: by slowing water runoff; by trapping sediment; and by stabilizing land, allowing vegetation to reclaim bare soil areas. The photos below show how this method is effective in a very short time. Labor for these efforts comes from volunteers in the community, Americorps workers, and groups such as the University of Guam Green Interns. The project has hundreds of volunteers, who to date have contributed over 1,500 hours of labor. To discourage arson by deer hunters, the Humåtak Project gives them alternative deer attractants such as salt licks free of charge, through a partnership with the Guam Coastal Management Program. The Humåtak Project is fulfilling a need for long-term, comprehensive data. Two of the Humåtak Project’s most important partners are the Guam Coastal Management Program Long-Term Coral Reef Monitoring Program, and the Guam Community Coral Reef Monitoring Program, which diligently monitor the health of the reef--including coral habitat and associated biological communities (reef fishes, sea stars, sea cucumbers, trochus, and other ecologically and economically important reef organisms)--in hopes of seeing improvement. Sedimentation in Fouha Bay is the focus of Austin Shelton’s current research for his Ph.D. in marine biology from the University of Hawai‘i. He has placed sediment traps and multiparameter datasondes throughout the bay to collect data about turbidity, temperature, and salinity. In another year or so the data will be processed and compared to data collected in 2003 and 1978. 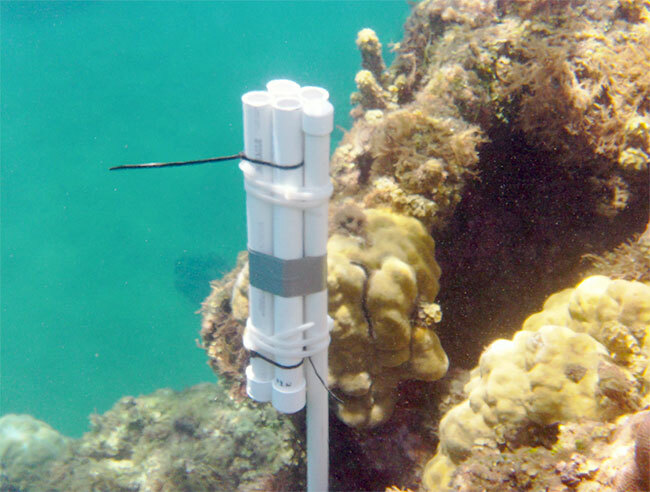 The data are expected to be useful in other projects, particularly in improving the science of mitigating for impacts to coral reefs and aquatic resources. Shelton notes that a proposed expansion of the U.S. military on Guam might possibly destroy 70 acres of coral reefs to make way for an aircraft carrier. Federal law requires “compensatory mitigation”—i.e., additional mitigation projects that, together with the proposed project, would result in no net loss of coral reefs. Thus it is important to quantify a correlation between, e.g., the number of trees and filter socks and the acres of coral reefs they might help to rehabilitate. The Humåtak Project’s slogan is “Reviving Guam, one bay at a time,” and Shelton hopes the model will spread to other watersheds.